UMUSTBEBORED: THE WILD HUNT is TERRIFIC!!! THE WILD HUNT is TERRIFIC!!! THE WILD HUNT is not a horror movie but it is kind of close. Its a serious film about the dangers of blurring the line between fantasy and reality. I didn't know much about this film when I bought it. All I knew is that it was a psychological thriller about LARPERS. We horror geeks know that the term "psychological thriller" means boring but us judgemental jerks who fear things we don't understand know that "LARPERS" means hilarious. How can you make a serious film about grown ups playing live action role play? I mean lets face it, 100% of us would have taken the material and push it to more of a comedy film than dark relationship drama turned tragedy. I know I would. But what we would have done is completely ruin a truly unique story that is nearly impossible to predict. The originality would be ruined forever. What I am saying folks is that this is a story I really haven't seen before or at least presented in this way in this setting. Erik is a young man who takes care of his sick father. His relationship with his girlfriend, Lyn is deteriorating. He loves her but she wants something more than a burned out life with Erik. Basically she is replacing their relationship with Live Action Role Play. She leaves him at home and goes and spends weekends in the woods at some super elaborate LARPING camp that has castles and huts and viking ships and other medieval times stuff. They go all out over there which only adds to the reality of their fantasy. Lyn is a princess in LARPING TOWN (which is what I call the place) and she enjoys the attention she gets especially from the Shaman who is like a bad guy who is the leader of some nomadic tribe. In the LARPING world she is his captive and she is a very important part of a ceremony called THE WILD HUNT. Unfortunately for Erik, Lyn is a woman and doesn't like to give definitive answers on the status of their relationship. Gee, that kind of sounds familiar. He fears that she is cheating on him with the other nerds so he goes on his own personal weekend quest to find her and doing so leads to a series of events that lead to bloodshed. Its good stuff is all I can say. With the color drained out of the THE WILD HUNT leaving only dominate white and grey colors I kind of thought that this was going to be a slow bleak film. This was going to be one mean spirited hell of a film but it isn't. While there isn't much color to the picture quality THE WILD HUNT shines with interesting colorful characters. You have a nerdy jerk king, a ref dressed like a fairy, an evil shaman, a guy dressed in full knight in shiny armor who gets winded from running around in a metal suit and best of all Erik's older brother Bjorn. Bjorn is a legend in the LARPING community. Bjorn is wonderful. He is so full of life and thunder. He helps Erik get his girl back through the rules of LARPING. He is a fun and tragic character too. Even when things are getting serious around him he still tries everyway he can to bend what is happening around him to fit into his overactive imagination. He doesn't want the fantasy to be interrupted. When things get really bad we see how much of a real hero he isn't when his brother needs his help. The Shaman is just a guy trying to keep up the fantasy too. He is just like Bjorn but isn't as over the top. The Shaman doesn't play the over the top loud mouth villain. He is much more subtle to the point of tricking Lyn into thinking she is about to be murdered for the Wild Hunt. You can see him test the line between real and fantasy. When the good guys bend the rules to steal Lyn it is he who goes off the reservation. He and his clan all take things way too far and become the characters for real. Horror happens. What is really neat is when he realizes what he has done and becomes himself again. You can see that he knows he has gone too far and suffers the consequences losing everything that he has fought for. The movie isn't completely dark and gloomy. The film recognizes the silliness of what these grown ups are doing. There are comedic moment throughout the film. It is a funny movie at times. The story builds and builds and doesn't become a simple dumb thrill ride about two people running from some nerds that have gone crazy from playing LARPING. 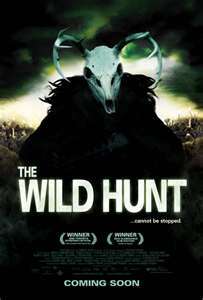 THE WILD HUNT is one of the smartest films I have seen in a long time. The movie makes me think. And the more I think about this film the more I love it. With the exception of the bleak cinematography I really don't have any gripes about this film. Its darn good stuff. Could something like this happen in real life? Normally I would say, no. But then when I think back on my time playing CALL OF DUTY I realize that I never played an online match without a bunch of people "rage quitting". You know that most people who play these games are a bunch of nerd-os. And you know that a lot of them play LARPNG stuff. My question is this. What do these rage quitters do when they can't rage quit out of LARPING? Lesson learned: Don't trust a nerd. THE END.